Mark Heaney is the chief strategist and founding partner of Get Real Health, a Rockville, Maryland-based health information technology (IT) company. Heaney has created award-winning software designs, including Get Real Health's instantPHR product, which is now deployed in health organizations worldwide. Prior to founding Get Real Health, he was the vice president of architecture and development at USWEB. During his career, he has spoken at numerous international forums, and has testified on Capitol Hill on the topic of health IT. 1. Unlike other programs that only have penalties, VBP offers the potential for payment increases for good performance that can offset payment penalties under other programs. 3. Many of the goals and measures of VBP overlap with or are tightly aligned with other value-based care incentive programs so efforts can be combined across programs. The VBP program contains a variety of measures used to determine payment increases or penalties as shown below. 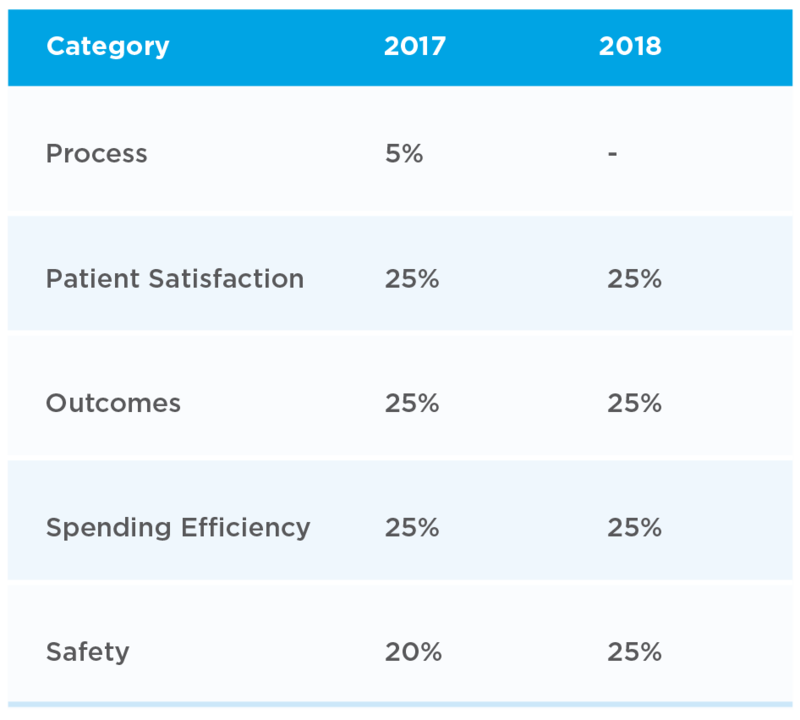 Effective patient engagement can impact all of these categories except Process and Safety, thereby influencing 70% to 75% of the total VBP score. The Hospital VBP program uses the Hospital Consumer Assessment of Healthcare Providers and Systems (HCAHPS) survey to measure the satisfaction of the patient and their family. Patients are asked about a variety of aspects of their interaction with the hospital in order to determine an overall satisfaction level. The entire hospital experience can be improved by engaging patients and their families before hospitalization, when possible. Patients and their families can be informed of what to bring, what to expect, how to navigate the facility, and other key pieces of information. They can also complete registration and information gathering tasks such as identifying meal preferences or other special needs ahead of time. They can absorb and provide this information at their own pace in the comfort of their own home instead of trying to do so in the overwhelming environment of the hospital. During their stay, online patient engagement tools can allow a patient’s family members, especially those who aren’t local, to get updates on the patient’s condition and access educational information without burdening care staff with incessant phone calls. After discharge, patients and their families can view instructions and educational materials to help them recover as quickly and completely as possible. Online patient engagement tools can also help them manage any post-discharge activities such as taking medication, completing physical therapy, or attending follow-up appointments. The Hospital VBP program outcomes measures are based on mortality and complication rates for common causes of hospitalizations. Engaging patients remotely can help prevent these negative outcomes in 2 ways. Firstly, by providing the patient and/or their home caregiver with tools to help them comply with post-discharge activities to prevent such outcomes. Secondly, remote monitoring technologies can detect warning signs and provide alerts to patients, caregivers, and healthcare professionals to allow timely and potentially lifesaving interventions. The Hospital VBP program calculates efficiency based on a Medicare spending per beneficiary formula. Better patient engagement, communication, and education as described above offer the means for reducing costly complications. It also provides the patient with ongoing access to online tools to continue to actively engage and participate in their own care on a consistent basis. Getting a patient to become a long-term partner in their own care can improve spending efficiency for years to come. The Hospital VBP Program is an important component in an overall value-based care strategy for hospitals. Effectively engaging the patient and, where applicable, home caregivers and family members, can improve VBP measures and payment adjustments. It may seem like a lot of work to implement such a comprehensive patient engagement strategy for a single value-based care program. However, the forms of patient engagement that will improve performance in the VBP program will also help with other governmental and private payer value-based care programs. All of these programs are trying to accomplish the same goals of delivering better care more cost-effectively and can benefit from the strategic use of patient engagement technology.